Boot season is in full swing now and if you are having a hard time picking which boots to add to your collection or if this season you want to shop a bit smarter while being budget conscious and without compromising on style ASOS has got you covered. Today, I am collaborating with ASOS to share my top boot season styles. Thanks, ASOS for sponsoring this post. I am wearing the classic Chelsea boots, this pair is called the ASOS DESIGN Atom leather Chelsea boots and it is available for $67. ASOS is changing the way I see boot season this Fall, from vegan-leather to leather, to the variety of styles, quality of shoes and sizes they have available. I am a US 11 and it is refreshing to know that they have my hard to find size covered. What I absolutely love about the ASOS DESIGN Atom leather Chelsea boots is its versatility. I am styling it two ways in today’s post with jeans (which I purchased from ASOS) and a simple black dress (Also via Asos HERE) over a black blazer. They are super comfortable and the best part is I can wear them year-round since they’re light boots. They run slightly small (wearing a UK 10, I usually wear a UK 9) and are narrow in the front. I won’t recommend them if you have wide feet. I broke into them after wearing them about 3 times. It was hard settling on one pair of boots so I have put together some of my favorite boot trends all leather options that are currently available on ASOS right now. Bonus ASOS still have their Black Friday discount available. You can save 25% off my ASOS DESIGN Atom leather Chelsea boots and everything on their website today! 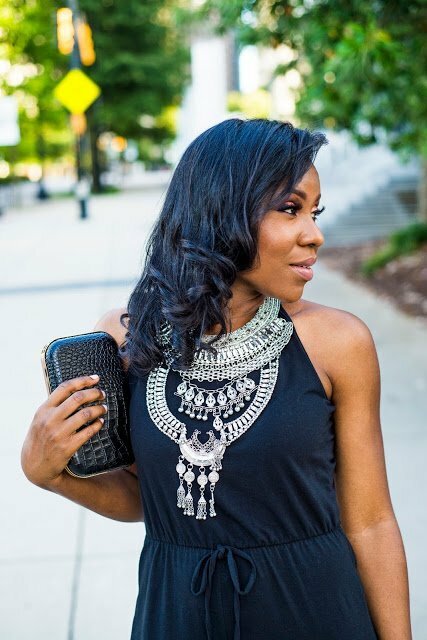 No look is complete without accessories, I have linked every piece I am wearing along with my lipstick below. I am restyling the now sold out polka-dot tulle skirt by Blaire of Atlantic-Pacific with this Zara blouse.